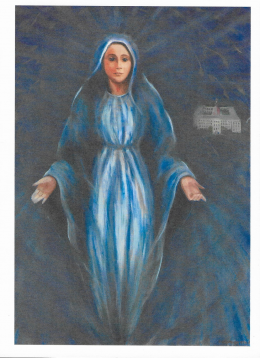 Our Lady of Light Foundation in the early 1990s saw the need to raise money for a farm near Falmouth, Kentucky where apparitions of Our Lady were alleged to have occurred. The Foundation secured the needed funds, purchased the farm, and participated in the renovation of the grounds and the erection of a chapel. 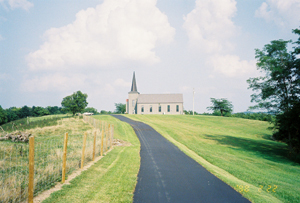 In 1995, the Foundation donated the property, now known as Our Lady’s Farm, to Our Lady of the Holy Spirit Center. Still active in scheduled activities at the Farm, Our Lady of Light Ministries is cultivating a vegetable garden there and continues to support the Farm in every way possible. 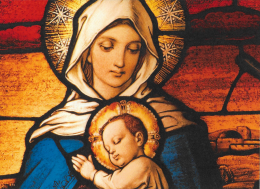 Eighth day of each month: As Our Lady wishes, the rosary is said at 11:00 a.m. followed by Mass at 11:30. When the 8th of the month falls on a Sunday we will then meet and pray on the 7th of the month. The first Saturday of May and October: A special Mass is offered for children and families. Rosary at 11:00 and mass at 11:30. Every Sunday, April through October: Greeters are on the grounds to talk and pray with pilgrims from 2:00 p.m. to 5:00 p.m.
Our Lady’s Farm Water is available at each of the above services. Please bring container to fill for your use. Visitation Hours: You are welcome on the grounds any day from morning to evening. Feel free to enjoy the farm at your leisure. Our Lady has asked us to pray the Joyful Mysteries of the rosary at her shrine, the Sorrowful mysteries at Cross Hill, and the Glorious Mysteries at the Holy Sepulcher Replica. While at the farm, you might want to take some time to walk the outdoor Stations of the Cross. From Cincinnati, take I-71 or I-75 south, follow signs to I-471. Take I-471 south across bridge to Kentucky and follow as it becomes U.S. 27 (south). Take U.S. 27 South, 19 miles to KY 177 at Butler. Turn Left. Follow KY 177 for 3.9 miles until it runs into KY 159. Turn right, go 2.5 miles. Our Lady’s Farm is on the left. From Indiana, take I-275 east to the Wilder exit (77). Turn right onto KY 9AA (AA Highway). Stay on KY 9AA for 21.4 miles to St. Rt. 159 West. Turn right, go 2.6 miles, turn left on KY 10. Go 0.3 miles, turn right on KY 159. Go 6.5 miles to Our Lady’s Farm on right. From Lexington, take I-75 north to U.S. 27 north (watch closely! U.S. 27 makes several turns in Paris) and proceed into Falmouth. Turn right onto KY 22 East. Cross bridge and turn left on KY 159. Go 6 miles to Our Lady’s Farm on right.